Whichever side of the Arab-Israeli conflict one stands on, you cannot deny the courage and perseverance of the Palestinian people. For generations, they have lived as stateless citizens, on one hand standing up to Israel, which controls their day-to-day lives, and on the other enduring their own leadership, which has betrayed them at every opportunity. It is sad to see their century-long quest for statehood crippled by the evil of Hamas, which has turned the legitimate Palestinian national struggle into an Islamic Jihad against Jews. Gaza could have become a showcase of Arab enlightenment and enterprise after Israel withdrew from the territory in 2005. It could have become a tourism haven and a crucible for learning and arts, science and technology. 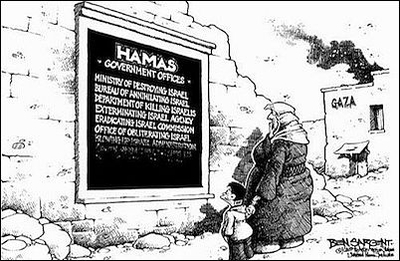 Instead, Gaza has become a one-party Islamic dictatorship under Hamas, dedicated to the destruction of the Jewish state of Israel. Thousands of precious lives have been lost in this macabre display of hatred disguised as piety. Its not just Israeli Jews that have been targeted for death. Palestinians opposed to Hamas have been massacred to consolidate its power. On Nov. 12, 2007 Hamas gunmen fired on a rally organized by Palestinian President Mahmoud Abbas' Fatah party inside a Gaza stadium, at an event held to commemorate the late Yasser Arafat. Many were killed. To the horror of the world, Hamas gunmen butchered Fatah fighters, throwing wounded men from the roof of a 15-storey building to their deaths. In the current clash between Israel and Hamas, another ceasefire will soon come into effect. The Americans and the United Nations will pour in millions of dollars to re-build bombed out infrastructure. But who will tell the Palestinians to get off the path of self-destruction? Who will convince the Palestinian Islamists to stop dreaming of destroying Israel and start building the future of their own people? Palestinians must reflect on why, after struggling for 100 years, their dream of statehood remains unfulfilled? They need to ask themselves why tiny countries under occupation by larger foes have become independent nations, while Palestinian statehood remains out of reach. Let us look at four examples. East Timor: For 400 years it was colonized by Portugal and in 1975 occupied by Indonesia. The one million, mostly Catholic, Timorese fought a long, bitter guerrilla war under Fretilin (Revolutionary Front of Independent East Timor) for freedom from the huge country of Islamic Indonesia, with a 300 million population. In 2002, East Timor won independence as the last Indonesian soldier left. Eritrea: Located in the Horn of Africa, Eritrea was annexed by its southern and larger neighbour, Ethiopia, in 1962. This triggered a 30-year guerrilla war that involved hijackings and assassinations, scarring an entire generation. However, in 1991 after a UN-supervised referendum, Eritrea gained its independence. Then there were the independence struggles of two Islamic countries that fought for and found statehood—Bangladesh in 1971 and Kosovo in 2008. In all four cases, these national liberation movements wanted their own freedom, not the destruction of the countries that occupied their land. East Timor didn't want to destroy Indonesia. Kosovo had no interest in wiping Serbia off the map. When Palestinians stop chanting for the death of Jews and Israel, and start working to secure their own state, they will achieve it. Palestinians have demonstrated courage and perseverance. What they need now, is wisdom.